Review posted January 24, 2015. Groundwood Books, Berkeley, 2014. 152 pages. My name is still Clare. That much is the same, although no one calls me Clare anymore. No one calls me anything anymore. I died when I was thirteen and came back as a cat. A stray cat in a strange place, very far from home. One moment I was walking out of my middle school in Bethlehem, Pennsylvania. Then there was a period of darkness, like being asleep. When I woke up, I was in Bethlehem – the real one. And I was a cat. Clare the cat is running from some mean neighborhood cats when she sees the chance to run into a house being opened by two soldiers. The soldiers are commandeering the house to conduct surveillance on the neighborhood, looking for terrorists. However, what they don’t know, and what Clare soon sniffs out, is that a boy is hiding in the house. In alternating chapters with what’s going on in Bethlehem, we also hear about what happened in Bethlehem, Pennsylvania. It turns out that Clare wasn’t a very nice girl. And she had particular conflict with one teacher in particular. That teacher made her write out a poem for detention – the same poem the Arab boy recites when he is worried or scared. The soldiers in the house are with the Israeli army, but one is an American who’s come over to help. Clare the cat can understand all languages since her death, so she’s in a good position to see what’s going on. There’s a crisis eventually between the soldiers and the boy and the people of Bethlehem. But what can a cat do to help? And why should she bother? I enjoyed this book. 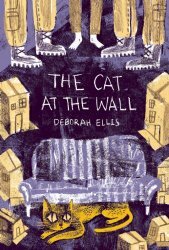 I admit, there were no explanations given why Clare would turn into a cat on the other side of the world, and no explanation why her teacher’s favorite poem would also be the favorite poem of a Palestinian boy. However, I like the way Clare’s story as a mean girl – which American kids will understand and recognize – is interwoven with the story of the Palestinian conflict, which is more removed from their experience. And I admit, I was so intrigued by the poem, I looked it up on google. It is Max Ehrmann’s “Desiderata,” written in 1952.
they too have their story….